I first saw Daniel Merriam’s art work at the tiny Avalon Gallery in Carmel, California, while on a mini-vacation with my sister. There were just a few giclees on display, but I was immediately enthralled with his work, which was filled with humor, wit, and fantasy — birds, bubbles, and butterflies. My sister bought his book, The Art of Daniel Merriam: The Impetus of Dreams, as an early birthday present for me, and we sat in our hotel room together, marveling over his art, as I read his words aloud. When I got home, I looked up Mr. Merriam’s name in Google, hoping to find out more about him and see more of his art work close-up. I discovered that he was being represented by the Louis Aronow Gallery in San Francisco. So the next time I went to the city, I stopped by. I was a bit disappointed that there were only a few pieces on display, but there was one original piece that I had seen in the book. It was amazing how much more impressive the original painting was. It was huge, and it appeared that he had applied mica to add a pearlescent shimmer to parts of the canvas. I was able to look at the intricacies in the designs that had been virtually invisible in the prints within his book. Looking at his work took my breath away. I talked to the manager of the gallery for a minute or two. I asked to be added to his mailing list, all the while feeling a little embarrassed because I knew I would never be able to afford one of Mr. Merriam’s paintings. I did, however, learn that Mr. Merriam was going to have a show in the gallery in November, so I was excited at the prospect of being able to see more of his work. Four months later I received an art card for the opening. There was even going to be an artist’s reception. It was the same week as my birthday, so my husband and I planned to go together with our son, John, and have dinner at our favorite Greek restaurant afterwards. The evening of the reception, I was a nervous wreck. I didn’t know what to wear. I wanted to look young, thin, hip, and attractive immediately. I wanted to look like someone who could buy Daniel Merriam’s art if I wanted to. I was a hopeless case. I wanted new clothes and a new hair do and perfect make-up. I wished to be anything but my frumpy, middle-aged self. But it was hopeless. As we hurried out the door, I grabbed his book and a Sharpie, hoping that the artist would be there and that he might sign my copy of his book. The gallery is smallish and narrow, although there are three levels. That evening it was packed with people. They had a table with little pieces of french bread and cheese and grapes. And there was wine being served. I was too excited to eat and too nervous to drink. As my hungry son and husband made a bee line for the food, I started at the wall nearest the entrance and methodically worked my way around the gallery walls, lingering over each incredible painting. For those of you unfamiliar with his work, Daniel Merriam is a watercolor artist who paints surreal, fantasy images of fairies and gargoyles, hybrid creatures straight from his imagination: butterflies that morph into bees, birds that swim through the air like fish. The colors are luminescent; every piece is a feast for the eyes. Intricate Victorian-style buildings grow out of stone, or meld into the trees, and transparent mysterious faces lurk in the unlikeliest of places. Colors range from bright and bold fantasmagorical carnival colors in one painting, to muted and fragile tones in the next. I tried to soak everything in as I stood in front of each canvas. I probably annoyed some people, as I planted myself inches away from each painting, examining everything, but I didn’t care. I felt that if I didn’t get close enough, I might miss something really important. As it was, I knew I’d never see enough and never see it all. “Why, yes he is.” He craned his neck, scanning the gallery. “He was in the back just a few minutes ago. He’s wearing a maroon jacket . . . and he’s the best looking man here,” he said. “Okay . . . well, I’ll go see if I can find him,” I replied breathlessly. I could hardly believe that there was a possibility that I was going to meet Daniel Merriam. I started moving towards the back of the gallery, trying to inconspicuously find him. My hands felt clammy. My stomach was in knots. I was half-dreading the thought of actually meeting him. I tried to fluff my hair, pinch my cheeks, bite my lip for color. Maybe I should just go, I began to think to myself. He probably has some beautiful, young, stylish woman on his arm or is deep in conversation with a wealthy patron of his art. Why would he want to talk to me anyhow? But it was too late to retreat, for there he was right in front of me, in that lovely maroon jacket, arms at his side, looking only slightly nervous, as though he would prefer to be surrounded by paints and canvas rather than schmoozing with potential buyers. It was love at first sight, even though I had already fallen in love with him before I even saw him. Because how could I not be immediately attracted to the person who could draw dreams I could only imagine? And there is was, with his back against the wall, looking impossibly handsome. “Daniel Merriam?” I asked tentatively. “Why, thank you,” he said, smiling just enough to verify that he did have perfect teeth. It was then that I realized that I didn’t know what to say next. I had a million questions, but no questions at all. I just wanted to talk to him– about what it was like to be an artist, about how he came up with all his amazing images. But I didn’t want to ask him anything stupid, and in so doing appear stupid myself. “Uhhh…so, how long does it take you to do one of your paintings?” I asked him. Maybe those weren’t his exact words. I didn’t write them down or hold up a tape recorder, but they seemed heartfelt and personal, as thought he had never said them to anyone else ever before. I asked him about the text that he added to the some of the paintings– tiny, barely legible, beautiful script that seems to seep out of the pores of the paper. “Can I come live with you in Maui?” I asked, dreamily. Okay, so I didn’t really say this, but I was thinking it. Out of the corner of my eye, I could see my son raising his eyebrows dramatically, giving me the “Let’s goooo, mom,” signal. And my sweet husband, waiting patiently with his jacket draped over his arms. I wondered what he thought of my feeble attempts at flirting. Did his hand hold mine just a beat longer than expected? Did his beautiful eyes speak to me of sun-drenched outings, and mid-afternoons drinking Pacificos by the beach at Maui? Nahhh. But I can dream, too, of getting to know the heart and soul of an artist whose work I admire so much. As I clutched his book to my chest and floated towards my husband, my son asked,”So how was it talking to your ‘hero’?” He emphasizing the word “hero” with air quotes and sarcasm, in that way that can immediately bring a middle-aged mom back down to earth. 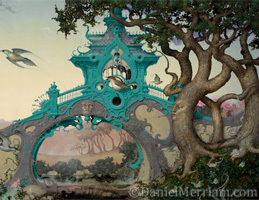 If you enjoyed reading this article, you may want to read about Meeting Daniel Merriam, Again.